The TGA wishes to congratulate Mr.John Hume for his signal success in this venture. We stand behind him in his every endeavour in this regard and we wish him further success in the years ahead. 1. We are pleased to report that our client John Hume has successfully concluded the world’s first legal online auction of rhinoceros horn. 2. The auction was preceded by a defended legal battle during which the South African Minister of Environmental Affairs and her department (DEA) appeared to make every effort to derail the auction and to discourage participation therein. Our client however persisted to enforce his constitutional rights and this resulted in the conclusion of this historical and ground breaking event. 3. Despite the supposed concerns published by the DEA prior to the auction and despite the fact that Mr Hume only received the auction permit on the morning that bidding was scheduled to commence, our client achieved what he set out to do more than 8 years ago: the establishment of a legal trade in a renewable natural resource to generate desperately needed funding to protect rhino as a species under siege. 4. The auction yielded fewer bidders and fewer sales than anticipated, but the legal domestic trade has now been re-established and the road has been paved for future sales. Our client shall comply with his reporting duties to the DEA in accordance with the conditions of the auction permit. We do not intend to publish the names of the purchasers or the prices achieved at the auction at this stage, out of respect for the privacy and confidentiality of the purchasers. We however assure the public that all bidders were duly authorised to participate in the auction and were issued with the legally required permits to so participate. The fact that very few bidders were willing to sign up for the auction can only be attributed to the unlawful delay in handing over the auction permit and the consequential limited time of less than two days for bidders to register. Many of the auction lots are still available for private treaty sales, subject to permits being obtained. All interested purchasers are invited to contact Van’s Auctioneers, Gauteng who will be able to accommodate and assist buyers in this regard. The DEA almost succeeded in enforcing the invalid rhino horn trade Moratorium, but our client persisted and triumphed. Clearly the demand for rhino horn remains and our rhino are still being slaughtered by the thousands, but as from today a legal and sustainable supply has been established. No longer will rhino need to be killed for their horn. No longer shall the supply come exclusively from dead rhino. From this day live rhino shall become more valuable than dead rhino. Despite government bullying tactics and illogical unsustainable animal rights propaganda, we will continue our fight to bring this dark trade into the light in order to conserve our rhinos. About Time – Lift the Ban! Not so cool in the long run. Whilst so many are tackling the rhino poaching issue by reducing demand, a multi millionaire is stimulating it. My suspicion of wealthy people’s motives for what they do in the name of conservation is not assuaged. It behoves the supplier (Hume) to get in bed with the syndicate bosses (names withheld – wonder why) to sell rhino horn. If there is no suspicion of who the ‘legitimate’ auction bidders are then the authorities who issue the licences and ‘legitimise’ the bidder are blinkered. It is a shell game where money and profit are the only winners in the end. In a nutshell the pro-rhino horn marketing lobby takes this view: The market for rhino horn is not going to go away. In the Far East the governments are complicit in the illegal trading. You have as much chance of stopping the trade in rhino horn as you have in stopping the Jewish people from circumcising their little boys. And because the trade is not going to go away, and because the trade ban doesn’t work, it makes complete sense to try legalising the trade to see if we can “manage” the trade in rhino horn – and make it sustainable – when all the trading is out in the open. If you have a better idea for stopping the poaching – bearing in mind all the circumstances referred to above – I would love to hear it. Mr Thomson. Thank you for your comments. Not sure in what context I should read all those encapsulated with quotation marks, but it seems I have struck a chord. My reputation in the conservation world may not reach the lofty heights of yourself or Mr. Hume, but opinions, from anyone, are important and should not be brushed aside. Perhaps in my brevity above I was jumping up and down on my soap box a little too enthusiastically. You ask for one example where demand has been curbed through one or more strategies of ‘prohibition’ – well here are a few…the fur trade is one, tobacco is another, currently the ivory trade is seeing a substantial downturn, Yemeni dagger handles – ironically made from rhino horn, Japenese appetite for whale meat. All this through attacking demand because it is socially abhorrent. It’s not a silver bullet (yet), but working against each other is not helping any of the species. Here is my problem – and it is an opinion which, like yours and the pro-trade opinions should not be tossed aside because it isn’t compliant with what each of us believes. Sure rhino horn is harvestable and perhaps is sustainable, but as soon as it becomes a commercial commodity, it will attract the worst kind of individuals driven by monetary gain, and as soon as that happens corruption follows, particularly in the countries involved on both sides of the trade. Why would a businessman like Mr. Hume sell his horn at a market killing price (say $3 an ounce versus $3000) – it doesn’t make sense (and the secrecy of the price only strengthens this argument). As long as the price remains high it suits any businessman worth his salt to keep it there and indeed manipulate the price to self benefit; whilst wearing a gossamer thin cloak of ‘conservation’. Now if a syndicate boss can still put horn into a (stimulated!) market at a price that undercuts the legitimate horn you don’t think he will? We are not dealing with scrupulous people here – these are people from a corrupt and corruptible environment where drugs, humans and guns complete their trade inventory . You say the 40 year old CITES ban didn’t work? Well I challenge that rather broad declaration because for 31 of those years it did. Yemeni demand plummeted because the ban forced a search for alternative materials, and China removed rhino horn from its 2000 year old pharmacopoeia. In fact the trade ban did make things better – a lot better. Only in 2008 was there a dramatic resurgence in demand/poaching because unscrupulous men in SE Asia saw a financial opportunity in a region where people wait 3 years to get treatment for cancer and a rising middle class could suddenly afford this readily available alternative ‘cure’. Simultaneously, social pressures for this rising middle class also opened an opportunity for these heinous individuals to promote horn as a ‘party drug’ and career promotion bribe. Why, pray tell, would anyone want to condone this by legitimising the trade in rhino horn? Do you want to be part of that? I honestly applaud Mr. Hume’s efforts in maintaining the largest private herd of white rhino, but I believe his considerable efforts and drive to legitimise rhino horn trade are terribly misplaced and, dare I say it, purely business orientated. Next commercially sustainable species will be the pangolin – how can we make a buck out of this disappearing animal? Oh wait, they are very hard to raise in captivity so we’ll not worry about them. There are some good ideas to stop the poaching. However, none of which I can claim as my own…..
i) Spend an equitable amount of money in providing better cancer health care in SE Asia as is being spent in anti-poaching efforts. iii) Work with celebrities (e.g. Yao Min, Jackie Chan) on media campaigns to change social behaviour – contrary to your view it IS working, and working well. Why anyone would want to compromise these hard won gains is what makes me cynical about hidden financial agendas by well heeled individuals. In a nutshell all efforts for rhino (and pangolin) conservation on the market side should be focused on reduction of demand not stimulation. In answer to your other questions…..
Zoologist by qualification, naturalist guide by profession (27 years). I am involved in three grass roots NGO’s – Chairman of Enviro911, Vice Chairman of CARACAL (Centre for Conservation of African Resources: · Animals, Communities, and Land use), Treasurer on the board of a community project (Kazungula Children’s Ark). Sorry, but no armchair for me! You and I stem from different ‘routes’ and we will never see eye to eye. I am convinced that nothing I say will change your mind so I am not going to waste my time trying to explain where ALL your animal rightist died-in-the-wool opinions are wrong. But I accept that you are entitled to your opinions. Nevertheless, I won’t tolerate you forcing them down my throat. Just let me say, however, that the fur trade is far from reaching its demise. In fact it is enjoying a huge comeback as honest and caring people in society the world over come to understand the truth about how it operates. If you kill the fur trade you also kill thousands of Arctic people because you will destroy their livelihoods. And if the ivory trade WAS seeing a downturn as you insist it is, why then has elephant poaching not diminished concurrently? And, if you investigated the facts surrounding Africa’s really big and recent-in-history elephant poaching events, you will find that they were all orchestrated by Africa’s corrupt political elite. How, pray, are you going to tackle THAT problem? Ivory and ivory carving has been part of Far Eastern culture as far back as human memory goes and it will not simply disappear because fanatical Western animal rightists says that it is bad. The Japanese taste for whale meat has not diminished. And Asian traditional medicine has used rhino horn (for whatever purpose) for thousands of years. So, if you believe that the almighty western white man can “persuade” the Asian people to stop using rhino horn in their medical treatments you are totally crazy. The trouble with Western urban intellect is that Westerners see Africa’s wildlife as being a “sacred cow” (which has to be protected – not “used” – at all cost) whilst people like me – who has been working in the wildlife profession for the last 58 years – see it as a “WILD product of the land” that can and should be used sustainably and wisely for the benefit of Africa’s people. Whether you like the idea or not, Africa’s wildlife is a commodity. It is something that is bought and sold throughout the world – and just because people like you object to the wildlife trade does not make YOUR negative opinion about it correct. If wildlife and/or its products is bought and sold, it IS “a commodity”. 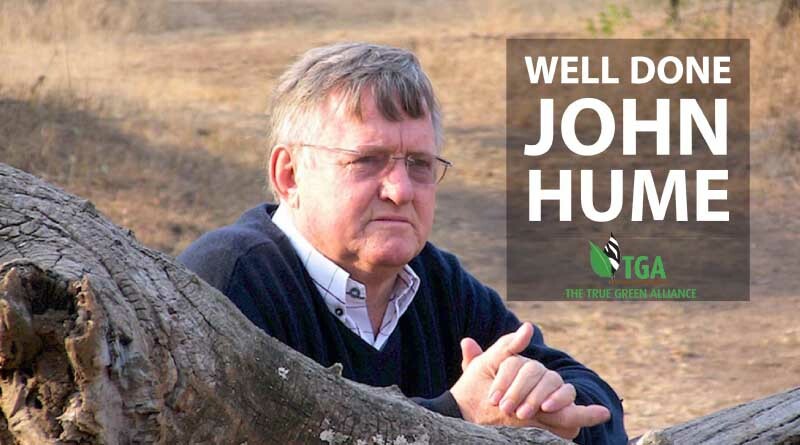 And people like John Hume and me – and many other honest and intelligent nature-loving people – believe that the best way (the ONLY way) to “save” Africa’s wildlife into posterity is to regulate the wildlife trade; to make it acceptable and legal; to improve upon the way it is conducted; to make it sustainable; and, where possible, to make it so valuable to the people who benefit from it that they will lay their lives down to protect it. As far as I am concerned, ANY kind of wildlife harvest is “acceptable” if it is sustainable – and provided the harvest is carried out humanely. For the record, I myself make not one cent out of the wildlife trade; nor from any other pursuit resultant from wildlife utilisation. You say that “opinions, from anyone, are important and should not be brushed aside”. I don’t agree. The opinions of paedophiles and serial rapists are not welcome in forums that are constructed to address the problem of abuse against women and children. And, by the same token, the opinions of animal rightists are not welcome in the world of constructive wildlife management. I don’t have time to argue with you. Your arguments do not impress me – neither do your “credentials”. So, Mr Nel, à dieu vous commant.